Rigid steel frames of the building are mainly considered as the Main Frames of PEB. 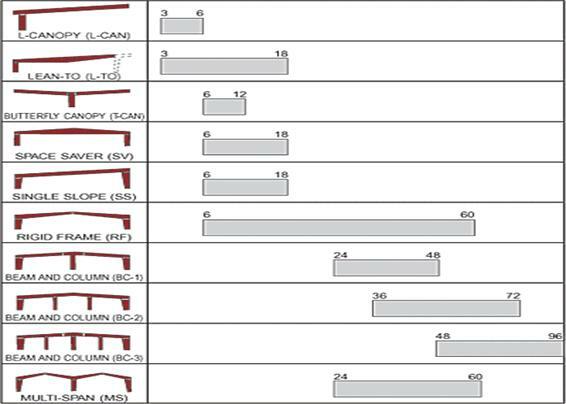 PEB rigid frame comprises of tapered columns and tapered rafters (the fabricated tapered sections are referred to as built-up members). The tapered sections are fabricated using the state of art technology wherein the flanges are welded to the web. 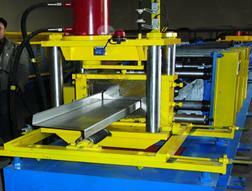 Splice plates are welded to the ends of the tapered sections. The frame is erected by bolting the splice plates of connecting sections together. 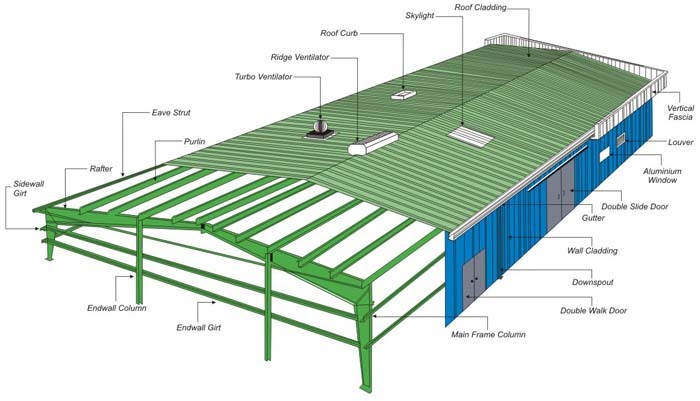 Purlins, Grits and Eave Struts are secondary structural members used to support the wall and roof panels. Purlins are used on the roof; Grits are used on the walls and Eave Struts are used at the intersection of the sidewall and the roof. Secondary members have two functions: they act as struts that help in resisting part of the longitudinal loads that are applied on the building such as wind and earthquake loads, and they provide lateral bracing to the compression flanges of the main frame members thereby increasing frame capacity. Panels used for sheeting purpose are generally of ribbed steel sheets used as roof and wall sheeting, roof and wall liners, partition and soffit sheeting. The steel sheets are generally produced from steel coils having thickness 0.5 mm to 0.7 mm high tensile stress. In present day scenario, newly developed type “S” panel, whose profile is designed to withstand heavy loads, such as roof snow loads and uplift loads resulting from high velocity (cyclonic) winds is widely prevalent. The type “S” steel panel conforms to ASTM A792M Grade 345B and is coated with a protective layer of Zincalume which is a 45 % zinc and 55 % aluminum alloy coating (150 g) m2 on both sides). 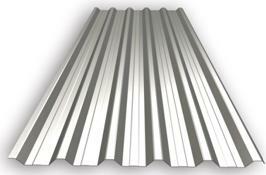 Type “S” steel panels are available in two nominal thicknesses: 0.5 mm and 0.7 mm, and in all standard colors. The other form of panels that are widely available is the G shaped panel. This deep – ribbed type ‘G’ panel is generally used as deck panelling for mezzanines and floor systems. Although exceptionally strong, ‘G’ shaped panel is used as shuttering for mezzanine reinforced concrete floors and panel is not a substitute for the reinforcement of mezzanine concrete slabs. The type ‘G’ panel is available only (unpainted) in 0.7 mm pre – galvanized coating over steel conforming to ASTM A653M SS Grade 550: Coating Z180. Normally the primary and secondary steel are coated with one coat (35 microns) of red oxide paint without any special treatment to steel. However, if some special paint has to be applied to steel in order to give better anti – corrosion properties, then the steel members have to be shot – blasted and then coated with the special paints. For houses; inside and outside painting on walls and false ceiling is to be provided. Steel or aluminium framed doors and windows are fixed to the purlins or the supporting profiled steel either by welding or bolted to the flanges already fixed to the purlins. Proper flashings are applied wherever necessary. False ceiling is usually required for residential buildings or offices. A metal frame work is hung from the ceiling and false ceiling of rigid boards are either bolted or placed over the frame work. Partition walls are usually required for residential building or offices. Partition wall comprises of two rigid boards having insulation sandwiched in between and fixed to the steel columns or supporting profiled steel and purlins. Alternatively, prefab sandwich panels can also be fixed to the columns and purlins. metal decking sheet is fixed to purlins and concrete poured over it. The most important parts of the Pre Engineered Building are Columns and Rafters which are otherwise called as Primary Structure. The major load of the building is being borne these members. Assembled Columns and Rafters make the frame of the buildings on which all other parts of the buildings are fixed. The design of these structures is done using advanced software such as STAAD PRO, Tekla etc. The usual load considerations are Live Load, Dead Load, Wind load, Collateral Load etc. Once the design of these are completed, detailed engineering and shop drawings will be prepared. These data will be transferred to the shop floor and the products are made. Z – Purlin, Girts, Eave struts etc are secondary members of structural framing. Z-Purlins are cold formed from steel which has minimum yield strength of 345 MPa. 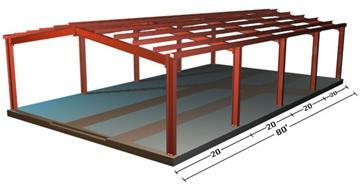 Purlins and Girts shall be roll formed Z sections, 200 mm deep with 64mm flanges(depends). Purlins are used in all Pre Engineered building as a secondary load member. 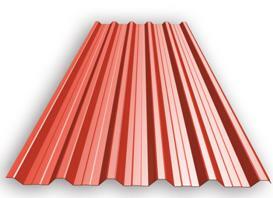 Trafford roof sheets come with various profiles and colours. These sheets are widely used for the Warehouses, Factory sheds etc. Trafford sheets are becoming more popular among residential building applications also these days. A panel assembly used as covering and consists of an insulating core material with inner and outer skins. Sandwich panels are manufactured by the press injection method to produce a rigid polyurethane core between exterior steel facing. The manufacturing process shall be carefully controlled with steel facing s maintained at around 40 C during the injection process to ensure proper reaction and adhesion. 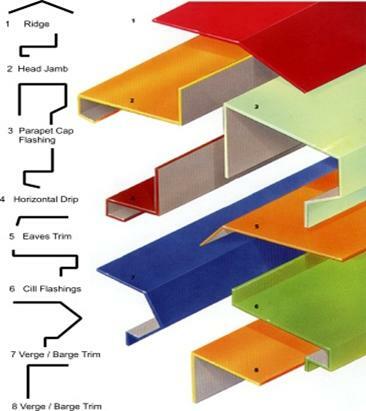 Curved eaves are formed from color coated steel after crimping and curving. Crimping is done in order to give an aesthetic appearance to the building. Curved eaves are widely used in Pre Engineered buildings. 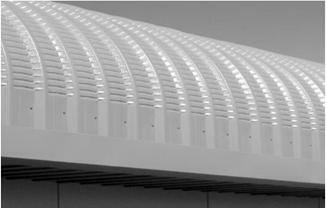 Louvers are basically windows and doors that provide air circulation. Depending on the customers’ requirements, different types of louvres can be manufactured in different colours as shown below.